… what? The sign over this building is broken off. 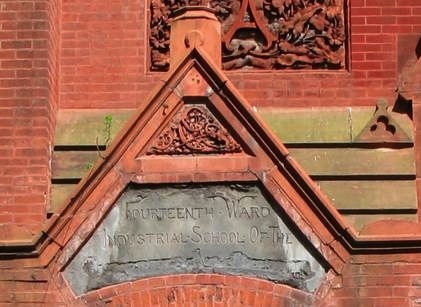 It says Fourteenth Ward Industrial School Of The and then the rest of the sign is gone. It was a school for the poor, put in place in 1889 by the Children’s Aid Society and paid for by John Jacob Astor III, in memory of his wife. 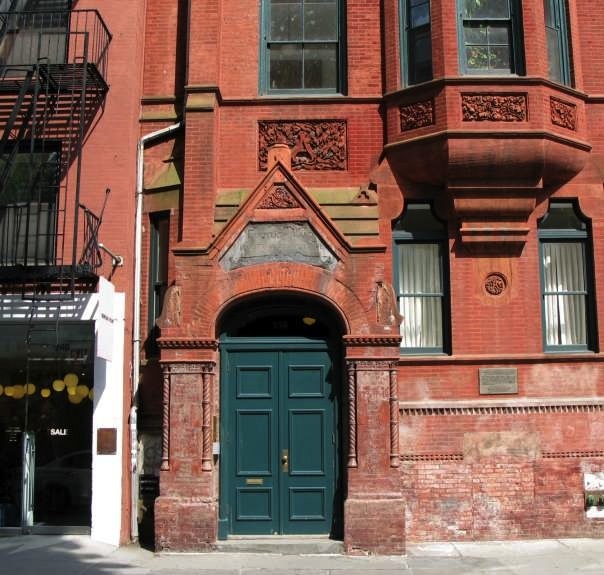 It replaced the original school that used to be at 93 Crosby Street. At the time, the Times described the area as one of “wretchedness, poverty and squalor.” (This is across the street from where Alec Baldwin just got married.) Christ. I just browsed the Times a little about the school and the area. Just one sad story after another. IE, a 16 year old “colored” girl tried to kill herself drinking laudanum. They fixed her up and sent her home. Next! You only live once and some people get such a terrible roll of the dice. I wonder about the principal, Miss H. E. Stevens. She was the principal from when it opened in 1863, until I don’t know when. She was still the principal when this building opened. I can’t even find out her first name. Was she an unmarried society lady, or did she come from this neighborhood herself? Wait, it seems like she may have lived at the school. I wonder if she worshipped across the street at Old St. Patrick’s? Maybe she’s in their records. Some pictures of the building that housed the school. A close-up of the sign. I found this in the Museum of the City of New York’s digital collection. 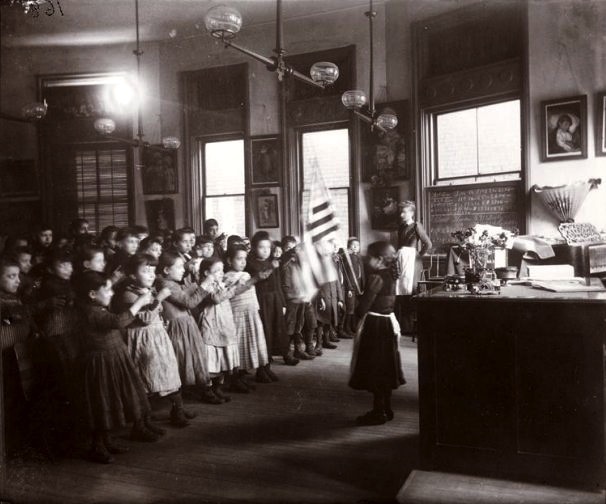 This is a picture of the inside of the school, taken in 1890. School of the what, indeed. Living Dead? Tragically hip? Actually, looking at where the capital letters seems to stick up, it just might have said Childrens Aid Society. Wish you could read what’s on the blackboard. I’ll bet a higher res scan would provide that. Do you ever go to http://www.shorpy.com? Full of super high res historical pics. I remember going to school in the 60’s and 70’s with no AC during our hottest days. They would let us break our dress code and wear shorts, but yuck, it was miserable then; it would have been horrendous dressed like that. I have always wondered how we managed back then but I really wonder how you did! Dan, yeah I know about shorpy, but I haven’t been there in a while. I wonder why that site doesn’t come up more when I do google searches. Also, that link didn’t work for me, but I’m wondering if it’s to pictures of the 14th ward industrial school? Because I did find a bunch on flick. Apparently it’s caught the attention of a lot of people! Thanks for finding that!! Good guess Dan!